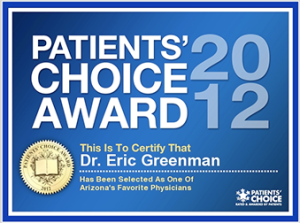 Phoenix Psychiatrist, Dr. Eric Greenman, M.D. Dr. Eric Greenman is a Board-Certified Scottsdale, Phoenix psychiatrist. Dr. Greenman provides a full range of psychiatric treatment to individuals in the Phoenix, Arizona metropolitan area. As a psychiatrist he is committed to providing patients with quality, compassionate, ethical and individualized care, taking the time to thoroughly evaluate each patient’s specific needs. His years of experience have earned national recognition and endorsements. Dr. Greenman has 20 years of experience treating children, adolescents and adults. Dr. Greenman provides thoughtful comprehensive care in a confidential environment. He understands the unique issues related to specific disorders and determining optimal treatment. Dr. Greenman is an expert in treating ADD, ADHD and Depression. His specialties include treating a wide range of psychological disorders including: Depression, Anxiety, Attention Deficit (ADD and ADHD), Autism, Addictions, PTSD, Panic Disorders, Eating Disorders, Sleep Disorders, Learning Disabilities, Bipolar and Mood Disorders, Women’s Hormone Issues, Childhood and Behavior Disorders, Obsessive Compulsive Disorder (OCD) and Impaired and Recovering Professionals. Dr. Greenman is listed in America’s Top Psychiatrists by the Consumers’ Research Council of America. He was also named one of Phoenix Magazine’s Top Docs. Last year he was awarded the Patient’s Choice Award.